… but what else would I come back with first but birds. The wacky weather this Fall surely has made the birds weird. Over the last couple of days in particular (but even over the last month) there have been unusual things happening. First things: does anybuddy know what this weed is? It produces small flat black arrowheadish seeds with two barbs at one end. Anyway, hate them for sticking to me and the dog, but happy to see that they also serve as bird feed. And this pic represents the return of the Goldfinches to the yard after an absence of about a month. Dunno why, but they always disappear as they molt in September, then I start to see ’em around this time and thru the whole Winter. Yesterday there were a half dozen of ’em, on this weed, at the freshly filled Niger feeders and the sunflower feeder too. And just when I reckoned that all the Sparrows had fled, ‘cept for the American Tree Sparrows which have arrived for the Winter (en masse, it seems), I saw a Fox Sparrow in the yard (two FOUR of ’em today). And, as my FB friends know, I was happy to see Rusty Blackbirds pass thru, one, then two, then four; today I have five. Curiously, no sign of Brown-Headed Cowbirds (Die Cowbirds! Die!). Grackles and Redwings are still around. And there’s still plenty of Juncos – a half dozen still appear in the yard. No surprise that multiple Mourning Doves are hitting the seed I scatter everyday, but since I noticed more than a dozen in the neighbourhood in Summer, it seems I’ll be obliged to care for more than usual over the Winter. And, of course, throw out bunches of seed and the pigeons appear. Oh well, whattaya gunna do? Haven’t seen ’em in the yard lately, but out to exercise my franchise today, I heard lots of Robins in the area; if this weather keeps up, maybe I’ll count multiples of ’em in the Xmas bird count. The resta the usual suspects are around – lots of Chickadees (still hopeful that a stray Boreal C might appear), I’m keeping a few Bluejays happy, and the Woodpeckers are appearing more regularly again (heard a Pileated, but no sightings yet). And speakina Woodpeckers, yesterday was the annual empty-the-freezer-to-make-birdfood day – 24 cakes, and a big bucket of ground goods to make more. A little more perverse this year: beef, chicken, pork (plus a bunch of collected fat), fish, a boodle of boiled eggs, mixed up with seed and peanut butter. Between my feed and the large amount of fruit on the trees, I’m hopin’ to see lots of good stuff this winter. Not holdin’ my breath for Crossbills – never seen ’em here, and the cones on the conifers are few this year. 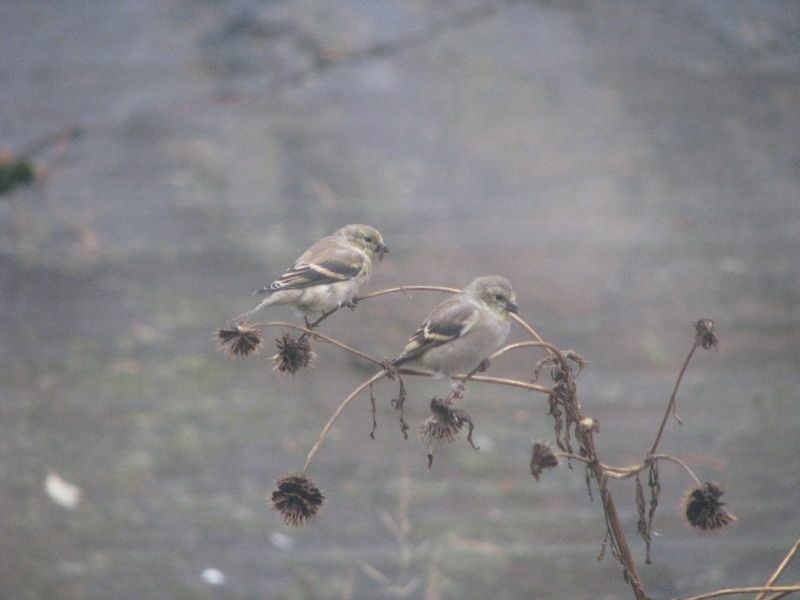 But once more, with feeling: cummon Snow Buntings! Still, I’ll be happy to see Grosbeaks and Bohemian Waxwings. Finally, it’s time to make a plan (and follow thru this year) for Project FeederWatch.